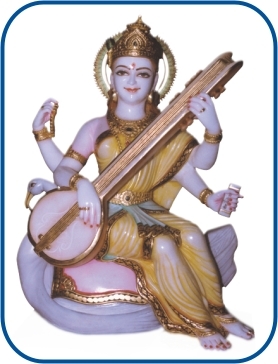 In the pantheonic framework, Sarasvati is the goddess of knowledge, learning and arts, specially performing arts. Which spells out the rationale behind the epithet Vedamata (Mother of the Vedas), popularly used for her. She is Vagesvari/Vagadevi (the Goddess of Speech ) as well. And is also known as Savitri, Gayatri, Brahmani, Satarupa, Sarda, and by many other names. Also meaning the ‘Flowing One’, Sarasvati happened to be an ancient Indian river in Punjab—where, on its sacred banks, the rsis/seers of yore were believed to have performed Vedic rituals or meditated on cosmic mysteries. In an invocation to Sarasvati, in the Brahmavaivarta Purana, the goddess is beseeched to bestow knowledge, memory, learning, the power of poetry, reputation and, above all, the capacity to bring knowledge to one’s disciples. The Mother Goddess has been worshipped, generation after generation, by students and scholars, by poets and performing artists alike ; leave alone the vast multitudes of devotees and believers over the rolling centuries. Tradition also attributes the invention of the Devanagari script to Sarasvati. In her popular anthropomorphic representations, Sarasvati rides the swan (and is thus, Hamsavahini) and has four arms that reinforce her divinity. She holds a rosary (of rudraksa beads) in one hand and scriptures, (possibly the Vedas), in the other. Her other two hands are shown to wield a stringed musical instrument, called Vina.